This is one of my ponderosa lemon trees. It's 4 years old from a small cutting and now planted in "soil" and producing plenty of juicy lemons all year round. This variety seems perfectly adapted to the hot tropical climate of the philippines unlike other varieties i've here. Apart from an evident zinc deficiency (that I'm trying to correct with Zinc sulphate solution spraying) this tree has never given any problem. Nevertheless, lately i noticed that somethig strange is happening. Some branches have weird "leaning" leaves with a wilted appearence. I looked out for worms/borers, parasites but i couldn't spot anything. In some pictures it's evident the difference between the upright normal leaves and the sick ones. PASSIONFRUIT - local variety 180 gr. My 2 grafted pomelos are both about 3 years old. Should i prune them? And if yes, severely? Or this is the normal shape of their canopy? I've a 4 years old pomelo seedling which is unfortunatly affected by citrus greening since late 2016. It's a beautiful tree, uncommonly nicely shaped with a round canopy unlike many seedlings which tends to have an upright and unattractive shape. The main trunk and branches have huge thorns but the youngest branches produced in the past 2 years are thornless. Growth in the last year hase been absolutely lacking because of the HLB disease. After reading several articles i took the decision to try my own experiment with thermal therapy. It's not easy since the three is quite big already (about 3m 9ft) and i haven't a PET film big enough to cover it thoroughly. I put a thermo-higrometer inside the canopy to monitor temperature and humidity. I'm confident to reach the therapeutical temperatures of about 45-50 °C (115-125 °F) since sun now is extremely strong here and inside i measured a temperature of about 34°C ( 93F) at just 8 am. I will try to control the temperature with the opening in the bottom of the bags. I'm planning to let the heat work for 5-6 days then i'll remove the bags, i'll prune water and fertilize and see wether i'll have some improvement or not . I am willing to re-pot my feminello zagara bianca lemon and i've a question. Since I am planning to keep it in a pot for life (not transferring it into the open soil) is it a good idea to drop it straight into its final destination (a 25 gallons pot) or better to gradually step-up with pot sizes until i will reach the final one? If this is the case, what is the best size increase every step? I've a 2 ft sapodilla seedling and a nice adult tree of giant sapodilla crowded of fruits. I'd like to try my luck at grafting. I know it's difficult because of the latex but according to your experience wich is the best/easiest grafring technique? Tropical Fruit Discussion / Keitt Mango yellowing leaves please help me identify the disease! Hello everybody this is my 5 y.o. grafted Keitt mango. It looks a bit ruffled (i've read it's quite common for this variety) but overall healthy. Nevertheless there are several leaves showing a strange form of yellowing. First some dark brown spots appear then the leaves start yellowing and eventually fall down. I couldn't spot any scritters/mites/aphids/insects inspecting both leaf sides with a 20x magnifying lens. During my recent trip to Davao i saw several plantations of grafted red pomelo trees . The most common varieties are Delacruz and the well known Magallanes. Typical citrus seedling growing habit (same like lemon) UPRIGHT and VERY THORNY. This seedlings was very big and was probably 10-15 years old (accourding to the land owner ) bearing several big fruits. This is a prove that a citrus seedling will eventually fruit after its juvenile period . It's not true as some people say that a seedling will never bear fruit! Note how green and healthy it looked despite being completely disregarded. Probably the deep fertile soil and the warm humid climate ae playing a big role. Skin was yellow and surprisingly thin. Flesh was light yellow not so sour, quite sweet but with a strong bitter aftertaste. I am just back fro ma trip to Davao Mindanao. Davao is considered the fruit capital of the Philippines and worlwide known for red sweet pomelo, durian and other fruits. Durian and Marang seem to grow everywhere from the simple gardens to the wild forest. Thy evidently like the fertile loamy deep soil and the copious evenly ditributed rainfall. Trees look so green and healthy! All these are seedlings of about 10 years old. Notice the bushy pyramidal growing habit. Some durian trees are also bearing small fruits now. As i said no it's NOT season for marang/durian/mangosteen. Here some pictures of the several fruit markets. Pomelos are SOOOOOOOO amazingly sweet. Marang so creamy and delicious. Durian .....well....the king of fruits has a category itself! There are several varieties available. This one is locally called ARANCILLO. Fruit are small with a yellow pulp. Smell is very very light. taste. is super good...impossible to describe, i would say ADDICTIVE! This is one of my favourite variety locally called PUYAT. Fruits can vary in size flesh is thick, orange color. Seeds are small, flat, i doubt they can be viable. being so flat the amount of edible flesh is really great. Very little if any smell (pleasant NOT stinky!) super creamy texture, exceedingly sweet with so complex taste and many overtones similar i'd say to a great whisky cream. NOTE: for anybody asking....... I didn't bring any seeds home! Now is NOT season and i want only fresh seeds from the best varieties harvested during the top of season. Tropical Fruit Discussion / Please help me ID this psidium - Strawberry guava? Psidium eugeniaefolia? Hello! I've a couple of little seedlings from seeds i bought on internet and coming from argentina. 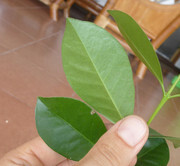 Leaves are thin, not leathery nor waxy and they are smooth and hairless. please help me ID it. Well after 4 and a half year i got to know that my grafted mango tree is NOT the typical philippines mang oi was expecting but a totaly DIFFERENT Keitt Mango !!! It's my fault since the little tree was bought by my wife and i never investigated until its "brother" another mango of the same bunch in my friend's garden bore unexpectedly huge and green fruits. I suspected that something was wrong because of the strange growing habit of my tree very open with spreading, leaning slender branches giving it a quite ruffled appearance. Has anyone experience with this KEITT variety? Is it a KEEP or TRASH?? One of my young jackfruit seedlings has quite strange leaves, resembling the ones of marang or breadfruit. The plant looks otherwise healthy. I've some scions of a good pumelo but no available rootstock at time. Is it possible to grafto onto a ponderosa lemon? The lemon is in full growing stage, is cleft graft a good choice? To all Marang lovers: Finally I have some seeds available. They are from the same fruits, same tree as last year. If you are importing seeds to US, Australia or other "strictly regulated" country please be aware you are doing at your own risk and read some useful information as follows. Thanks! Mexico has just been rocked by a devastating 8.1 magnitude earthquake. This year is very fruitful and after the soursop, also one of my avocado seedlings fruited for the first time. It blossomed last march at exactly 4 years of age, type A flower. It managed to set fruits llthough there were no other avocadoes flowering around and about 10 fruitlets appeared a month later. Last sunday i harvested the first one. Skin is leathery and fruit is easily peeled by hands. This is how it looked when i opened. The taste is really delicious. Surely one of the best tasting avocadoes i've tried in my whole life (i tasted avocadoes from several parts of the world including the popular HASS variety. Texture is creamy, flavour is very full, deep, with slight nutty aftertaste, no hard portions, no small "rootlets" . Chewing the flesh you've the feeling the whole mouth gets "kneaded" it's so far from many watery avocadoes i tried before. Unfortunately i've no mean to measure the oil content and no picture can render the taste. I can confirm that, as well known, avocado does NOT come true from seed. I still remember the fruit where i got the seed from and I can say that the seedling got just the taste and flesh color from its "mother" inheriting all other characteristics from the (unknown) father through cross pollination. I'm sharing this with alll members being thankful for the many advices/hints/inspiration i got in this forum. After 4 years my guyabano seedling fruited! Last year the tree had about 30 flowers but didn't set any fruit. This year just 20 flowers but is bearing 6 fruits already. The fruit was a bit over 1.2 kg (2.6 pounds) Flesh was not fibrous but more on the crisp-creamy side. Taste was really superb, very sweet (compared to the other many guyabano i tried) with a hint of sour to create a nice balanced flavour. I just wanted to share my happiness with the members of this forum, thanks everybody for the many ideas/advices/help you give me everyday! I decided to start with a jackfruit since according to other members it seems easier than other species and also i've several seeds available for experimenting. I planted 3 jackfruit seeds close to each other in a pot and i grafted them after about 2 months. Today, after 35 days from grafting I completely removed the PET tape and cut the two "sacrifical" seedlings top leaving just one. Very much surprisingly (for my grafting skills) it seems they have both taken! A huge thanks to all member of forum for suggestions and inspiration especially to Kevin and Simon. Hello! I'm looking for VIABLE seeds and/or cuttings of sweet tamarind (tamrindus indica). My 3 years old black sapote seedling is flowering for the first time. Flowers are really weird, just pale green and not fragrant. I know this species is Dioecious having separate female and male trees. - are these flowers male or female or ermaphrodit? - just in case there are female, since there are no other trees of the same species around, how can they get pollinated? will they still set fruits? Thanks in advance for helping! Among the fruit trees i've in my garden this one is really surprising me. No need to wait for YEARS to get a reward to your effort. I planted a small seedling ( about 20cm or 3/4 ft ) last september 2016. In beginning of april 2017 i had already harvested a couple of fruits. Now, the tree is full blooming and at the same has plenty of ripening fruits. The taste is really unique, not very sweet but pleasantly sweet and with a dense, buttery texture and a peanut aftertaste. By the way, according to the scientific research it's also healthy being very antioxidant rich (thus the intense red colour). This weed is invading a portion of my land. It grows very quickly straight on gravel rocks and limestone and it's extremely heat and drought resistant. It's roots are ENORMOUS and disproportionate compared to the plant size especially when it's still young. It's difficult to remove, any piece of root left in the soil will eventually sprout back. Any idea of what is it? Citrus General Discussion / Is this citrus greening? Among my citrus trees there is one that i love particularly. It's a nearly 3 years old pomelo SEEDLING. It's growing steadily with a graceful shape (uncommonly not straight upright) a strong thorny trunk and a dense, thornless canopee. I've the feeling that it might start to flower in just a couple of years. Unfortunately the last months I didn't notice any new growth, it's like the plant stopped despite watering and fertilizing. This is how they look some of the leaves now. Are these the early symptoms of citrus greening? My black sapote seedling will turn 3 years old this coming july. It's growing slowly but nicely, it's about 6 feet (2 meters) high. The only one problem is that some of the leaves are showing a strange-pattern yellowing. It's affecting mainly the older leaves. I guess it's some mineral deficiency but i'm not sure. Maybe Magnesium? Or Zinc? Thanks in advance for any help/suggestion! I finally found a great quality jackfruit in my place and i'd like to try to reproduce it by marcotting / air layering. Since i've no experience with jackfruit but just with fig tree and mulberry (very easy) I'm asking for help. Any advice/suggestion is well appreciated.